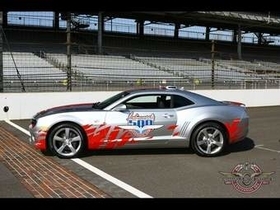 Although the new Chevrolet Camaro will be the pace car for the Indianapolis 500 race in May, General Motors will break with the past and not offer consumers a limited-edition pace car replica. In the past, when GM cars have been chosen to lead the Indy 500, the company has built small runs of identical looking pace car replicas for collectors. Virtually all the Oldsmobiles, Chevrolets and Pontiacs that have received the pace car treatment have now become highly prized collector items. But Chevrolet spokesman Terry Rhadigan said Chevy decided not to offer a special-edition Camaro in part because there already are 14,000 sold orders for the car. Production, he said, is on track to start March 16, with the first cars scheduled to arrive at dealerships around the first week of April. The new Camaro should be a bright spot for GM this spring. Camaro fans were fuming when GM killed the Camaro in 2002. The new car has strong styling cues from the classic first-generation 1967-69 Camaro. The base model, which starts at $22,995, including shipping, features a 304-hp V-6 base engine that delivers 27 mpg. That car already has won good reviews from auto critics. Rhadigan said some of the nations higher-volume dealers should have a good selection of Camaros by the end of summer, but most of the early cars will be delivered soon after they arrive at dealerships to consumers who have put down deposits.